If you aren’t that into decorating your home with red hearts and pink this Valentine’s Day, I’m right there with you. As a home decor blog I try to choose craft projects that I would really, truly use to decorate my home. Although it is hard to avoid the temptation to create “cutesy” decor since I have access to so many fun templates. When I do make my own home decor, it has to pass my “would I buy this if I saw it at Homegoods?” test. 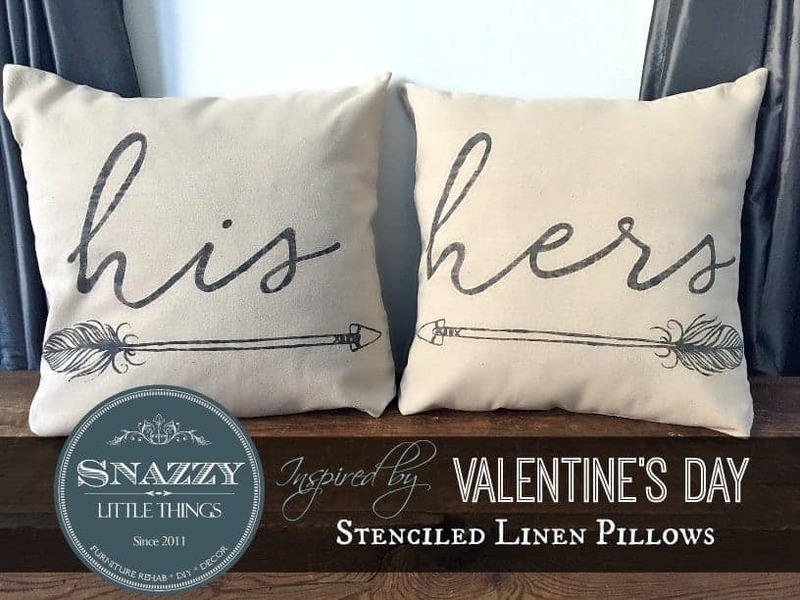 So if you’re in the mood for a fun (and not too-cutesy) project or you have a wedding coming in your family, my “his and hers” arrow pillows stencil might be the answer! For our shop I’ve been making my own stenciled pillow covers. I essentially make the image in Photoshop, then upload that image into my Silhouette Cameo, then cut the stencils. These will be for sale at our upcoming shows this spring. You can easily download these and make them using a Silhouette Cameo, or you can simply print and frame the the his + hers image to download. You will need to follow my tutorial on how to create a transfer using a Silhouette Cameo. I also provide more detailed instructions in my antler pillow cover tutorial. Become a subscriber to receive access to all of my free templates. Need more inspiration? I’ve joined these lovely ladies who offer you even more Valentine’s Day craft ideas! Oooh – I just love these! I like that they aren’t over the top Valentine’s Day’ish and could easily be used year round. I know what you mean about the house looking a bit sad and empty now that Christmas has been put away! I just adore, adore your His & Hers pillows! So happy to be celebrating Valentine’s Day ideas with you! I want these pillows! Just perfect for Valentine’s Day ! The arrows are the perfect touch. These are such fun! They do look like they are professionally printed! Just perfect! Hi I am really really hoping to get the arrow pillows but with a “hers” and “hers” set. I would like the arrowss to face each other. Sure! My brother in law custom cuts each stencil, he mails it to me and then I hand stencil each pillow cover. If you needed it before Valentine’s Day it might be tough. But we can likely cut a stencil set for you to be delivered sometime next week. Let me check and I will email you if you’re still interested. Love them! Perfect colors and everything. Thanks so much, we love them too. Lots of “Mr. & Mrs.” stuff around here since our wedding last summer.